On August 1, 2017, the UW Department of Family Medicine and Community Health (DFMCH) welcomed its newest research faculty member, Edmond Ramly, PhD. The DFMCH’s Edmond Ramly, PhD, is a health systems engineer whose work focuses on designing best practices for ambulatory care that balance standardization and local adaptations. Dr. Ramly is a health systems engineer whose work focuses on designing best practices for ambulatory care, while balancing standardization and local adaptations. More specifically, he aims to integrate clinical evidence, implementation strategies and organizational processes to increase the chances of clinical innovations becoming routine practice. One example of Dr. Ramly’s current work is a project to improve primary care follow-up for rheumatology patients who have high blood pressure. He’s collaborating with Christie Bartels, MD, MS, an assistant professor in the UW Department of Medicine’s Division of Rheumatology, to design an intervention in which clinic staff identify patients with elevated blood pressure, provide them with brief counseling and connect them to primary care providers for timely follow-up (read abstract). The team piloted the project at the three UW Health rheumatology clinics; preliminary results showed that the intervention doubled odds of timely follow-up compared to pre-intervention usual care, sustained the improvements at 18 months, and showed a significant decrease in population-level rate of high blood pressure from 17% to 8% over 24 months. Now, the team is partnering with Gundersen Health System to test the intervention in clinics there. Dr. Ramly has also worked with Christopher J. Crnich, MD, an associate professor in the UW Department of Medicine’s Division of Infectious Diseases, to reduce inappropriate antibiotic prescribing in six nursing homes in Wisconsin and Pennsylvania. Through chart reviews and stakeholder interviews, they prospectively collected quantitative and qualitative data on current antibiotic utilization and prescribing processes. They then designed ways to avoid or delay antibiotics before they are prescribed; and ways to shorten, change or stop antibiotics after they are prescribed. The team then helped the nursing homes weave these interventions into their existing processes, and aggregate the results for review at quality and performance improvement meetings each quarter. Preliminary findings include work systems influences on antibiotic prescribing and prescribers’ information needs for antibiotic de-escalation. Both projects build not only on Dr. Ramly’s systems engineering training, but also his expertise with stakeholder-engaged implementation science—the interactive, field-based work that he believes is critical to the success of any improvement project. Dr. Ramly came to the DFMCH from the UW-Madison Center for Health Systems Research and Analysis (CHSRA). He has also been a quality improvement consultant at a private corporation and at University Hospital, and has conducted medical operations research at the RAND Corporation. He was second author on the Agency for Healthcare Research and Quality/National Science Foundation report, “Industrial and Systems Engineering and Health Care: Critical Areas of Research”. 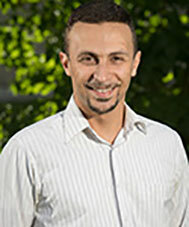 He is also a founding advisory board member of the Wisconsin Coalition for Collaborative Excellence in Assisted Living (WCCEAL), the first and largest assisted living quality benchmarking system in the U.S.
Dr. Ramly earned a PhD in Industrial and Systems Engineering, with a specialization in health systems engineering, from UW-Madison. His office is at the Health Innovation Program, and he travels to Alumni Hall frequently to meet with faculty and staff. To discuss potential project collaborations, email him at ramly@wisc.edu or call (608) 698-4656.